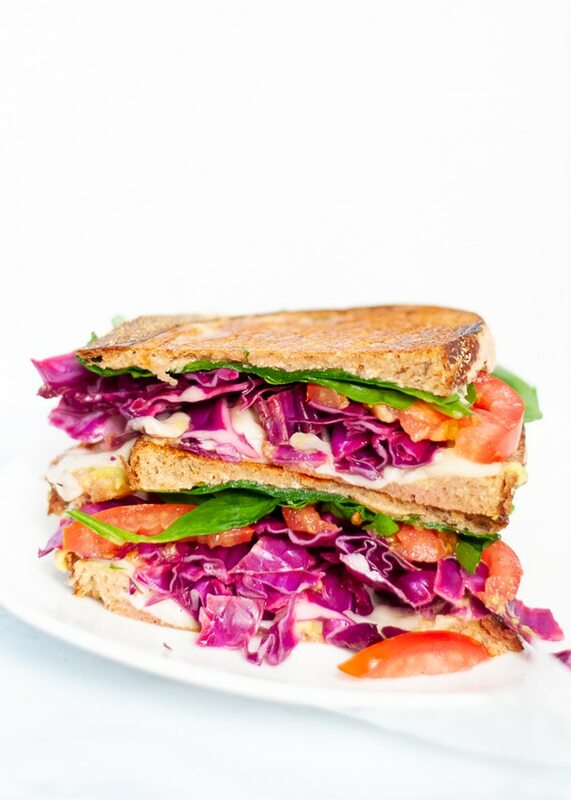 This vegetarian reuben recipe is a delicious twist on a classic grilled Reuben sandwich. Quick pickled cabbage in place of corned beef makes for a flavor packed and healthy vegetarian comfort food. 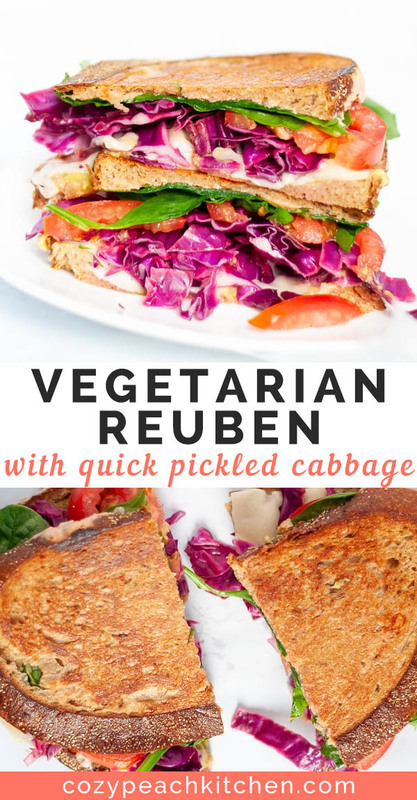 This vegetarian reuben recipe is a long time coming. It’s 100% inspired by one of my favorite restaurants in Athens, Georgia (aka my college town): Trapeze Pub. 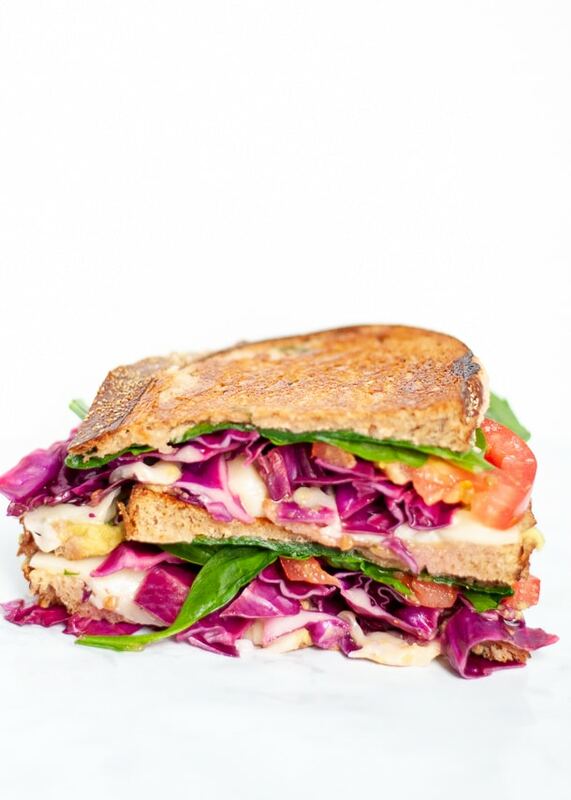 Their veggie Reuben is loaded with pickled cabbage and smothered in a classic horseradish sauce. You could say I’m trying to relive my college years with this sandwich, but I’m really just trying to eat one of my favorite comfort food dishes when I’m 2500 miles from home. What’s inside a vegetarian reuben? Spicy, tangy, horseradish sauce brings a flavorful kick – and it’s a surprisingly healthy spread, because it’s made with Greek yogurt instead of the traditional mayo. Creamy avocado! Because no sandwich is complete without avocado. Sliced tomatoes; fresh, juicy, and the perfect sandwich topper. As much fresh spinach as you like. And if you’re like me, that means a lot of spinach! Last but not least: quick pickled cabbage. How do you make quick pickled cabbage? Summer is on the brink, which means that pickling and fermenting are soon to be a constant in my house. Pickling is super easy- just combine equal parts vinegar and water, a bit of salt, and desired flavorings. I keep this recipe simple with only garlic and a tiny bit of sugar. Pickling red cabbage for just four hours allows the crunchy cabbage to break down just a bit, while keeping it just chewy enough for the classic Reuben texture. You can prepare pickled cabbage hours to days in advance if you prefer. The cabbage will be softer, but should still keep its crunch. 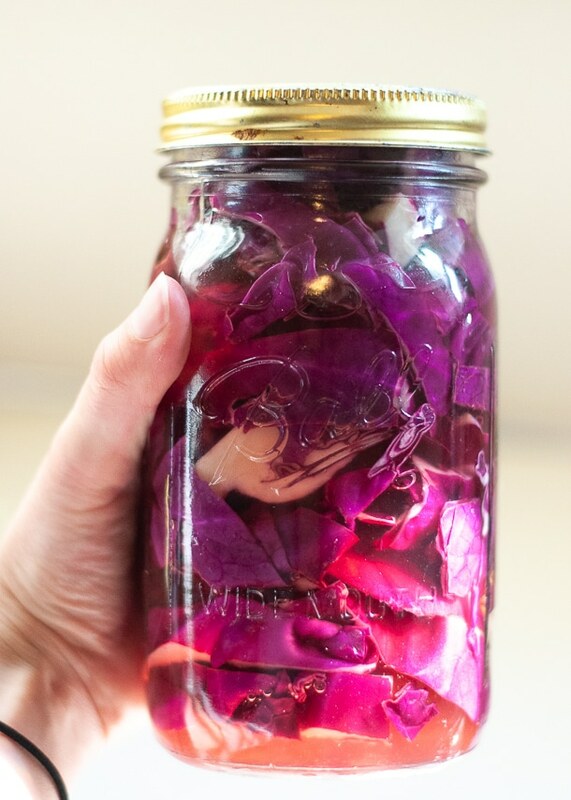 This quick pickled cabbage is adapted from (and inspired by!) Edible Perspective’s recipe. She gives a great primer on quick pickling! Layers of crispy and savory goodness! You’ll want to layer on all of the ingredients between two slices of sourdough rye bread, but any rye will do the trick. No particular order required: just smash the ingredients between two layers of rye bread and press either in a panini press or on the stove. If using the stove, make a makeshift press using a weighted plate or pan on top of the sandwich. This makes sure that the reuben gets nice and flat and melded together with the swiss cheese. 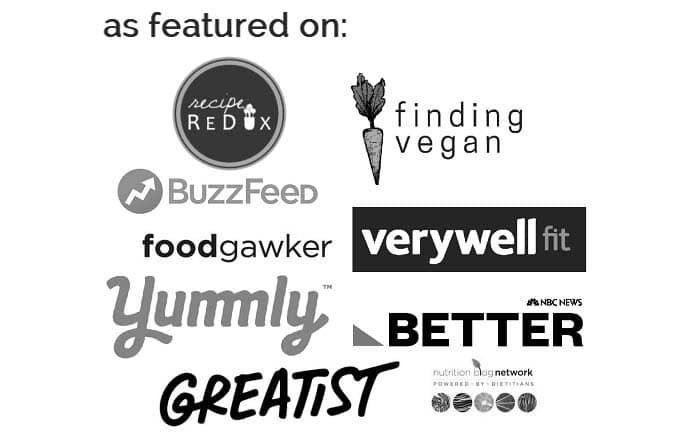 Want to make it a vegan reuben? Just substitute the greek yogurt for vegan mayo and replace the cheese with your favorite vegan cheese. 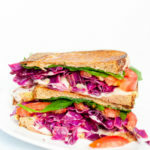 Vegetarian reubens are a delicious twist on the classic grilled reuben sandwich. Quick pickled cabbage makes for a flavor packed and healthy vegetarian comfort food. Slice the red cabbage into ½ inch strips. 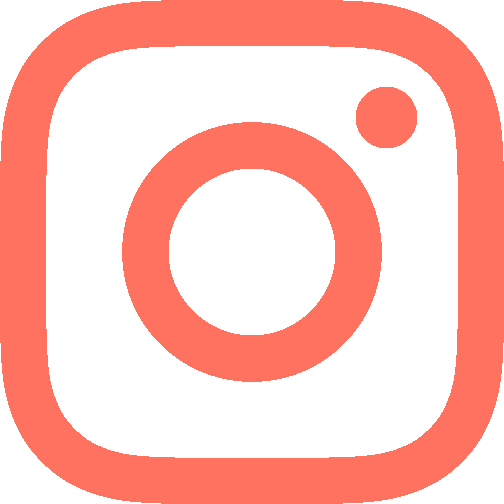 In a one liter mason jar (or other similar sized container) mix together water, vinegar, salt, and sugar until salt and sugar are mostly dissolved. Add cabbage and garlic, making sure that all of the cabbage is fully covered with liquid. Refrigerate for at least four hours. Combine all ingredients in a small bowl, mixing to combine. Recipe makes four sandwiches. Instructions are for one sandwich: Preheat panini press to medium high heat*. Remove 1/2 cup pickled cabbage from container. Pat the cabbage with a paper towel to remove excess liquid. Spread two tablespoons of horseradish sauce on two slices of rye bread. 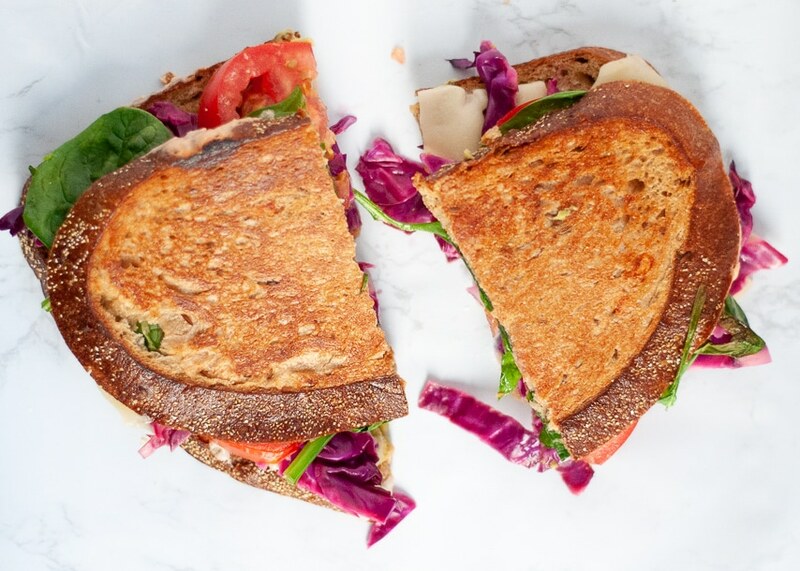 Layer on one piece of rye bread: 1/2 roma tomato (sliced), 1/4 avocado (sliced), 1/2 cup spinach, one slice of Swiss cheese, 1/2 cup pickled cabbage. Press on panini press until golden brown, about 3-5 minutes. Enjoy immediately. 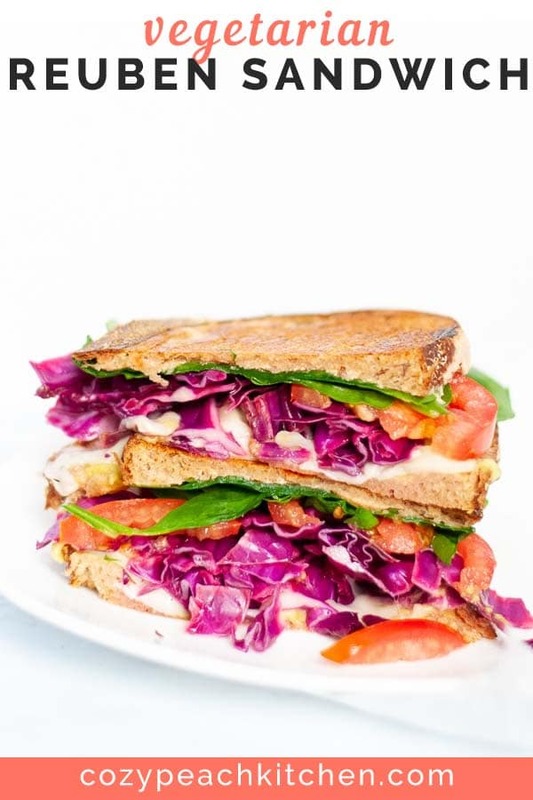 *If you don't have a panini press, you can make this sandwich on the stovetop. Heat a medium frying pan over medium high heat; layer with thin coat of oil if needed. Place a plate on the sandwich and press down, as a panini press would. Flip when sandwich is golden brown. Previous Post: « Chocolate Snickerdoodle Dessert Hummus: Two in One Recipe!